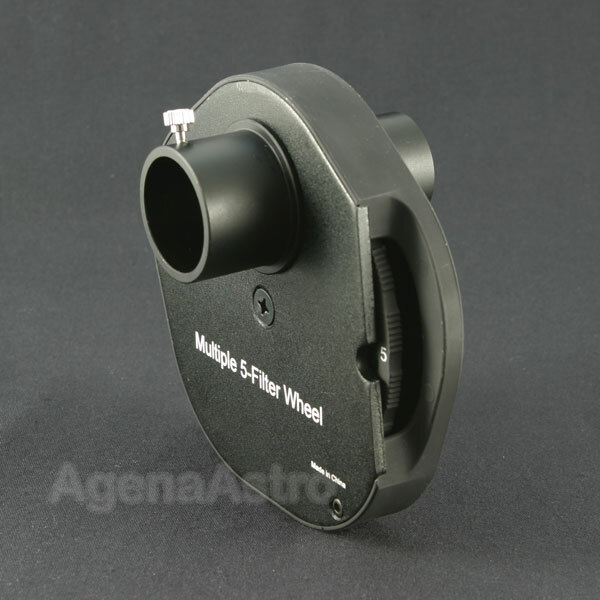 Astrophotographers and visual observers alike will benefit from the addition of an affordable, high quality filter wheel to their telescope setup. The Agena 5-Piece Filter Wheel INCLUDES five 1.25″ imaging filters – red (25), green (56), yellow (12), blue (80A), and a ND96 0.3 (50% transmission neutral density), or you can leave one position empty for unfiltered viewing. The filter wheel is attached directly to your telescope's focuser - via the removable 1.25" nose piece – making filter changes fast and easy. Thumbscrews are provided for fast, tool-free removal and installation of filters. Positive click stops for each position ensure the filter is placed precisely in the telescope's light path. Visual observers can attach the included 1.25" eyepiece adapter to the filter wheel and install their star diagonal to hold an eyepiece as usual. No more removing the eyepiece, unscrewing the filter, screwing on a different filter, and placing the eyepiece back into the star diagonal. A simple turn of the wheel to the desired filter is all it takes. Up to five filters can be installed. Astrophotographers can remove the included filters and install their 1.25" LRGB filter set, and then attach the imaging device to the provided T-thread camera adapter. You’re then able to quickly move the wheel to each filter in succession for the required exposures - with minimal interruption. There is no need to remove the imaging device from the focuser, virtually eliminating image shift. A knurled locking ring ensures the imaging device is securely attached to the T adapter in any orientation desired. The nominal 20mm back focus requirement is within the capability of most modern focusers The filter wheel's versatility allows you to easily and quickly configure the filter positions to best suit your needs. The lightweight aluminum housing protects installed filters from dirt, moisture, and impact better than other designs on the market. When removed from the telescope, two provided plastic dust caps continue to keep your filters free of dust and smudges while in storage.